The whole family recently spent a full week in Scotland based at Loch Ness in a very beautiful lodge on the shores of Loch Ness. As well as the amazing views on the six-hour drive from Newcastle we also saw some amazing places on our travels on both the East and West coast of Scotland. The Highlands has so much to offer visitors. 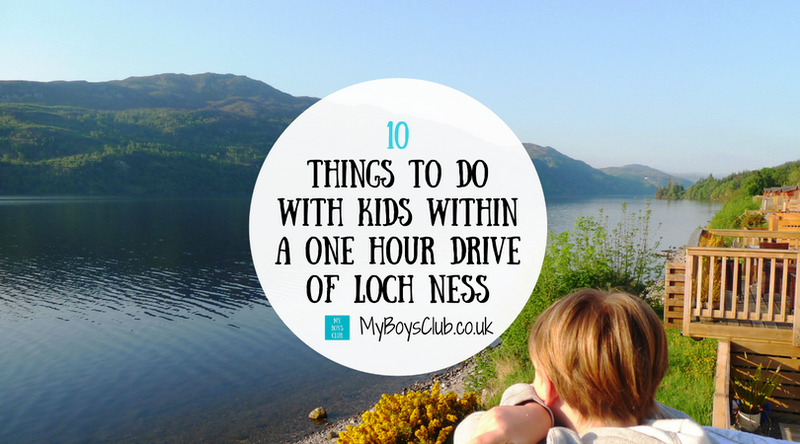 Here are our top 10 things to do in Scotland with kids that are within a one-hour drive time of Loch Ness. We were staying at the Loch Ness Highland Lodges near Invermosriston and distances and times are from there. Explore Loch Ness by Jacobite, by sailing on its legendary waters hopefully discovering all about the monster, Scottish history and more. 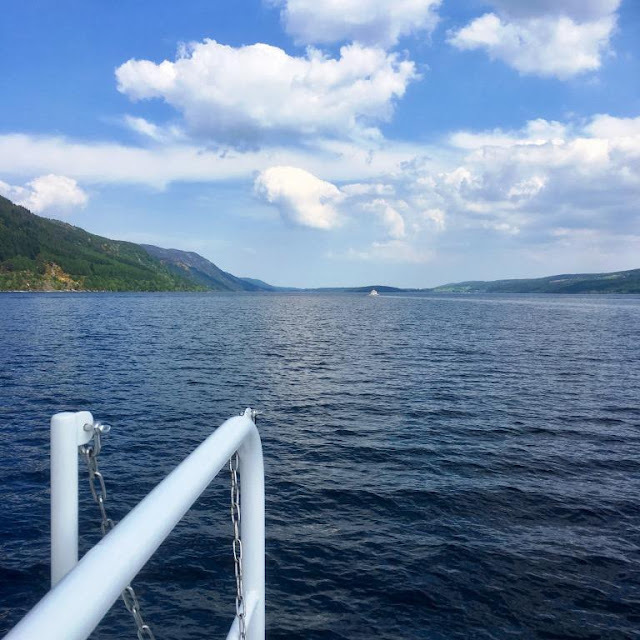 For over 40 years, Jacobite Cruises have been helping customers to experience the mysteries and myths of the world famous Loch Ness The Jacobite Inspiration Cruise is a one hour trip from the Clansman Harbour down to Urquhart Castle. There is also an option to combine a cruise with a castle visit in which case you depart for one hour and then are picked up the next boat. Urquhart Castle is stunning. The location on the loch side is just lovely. 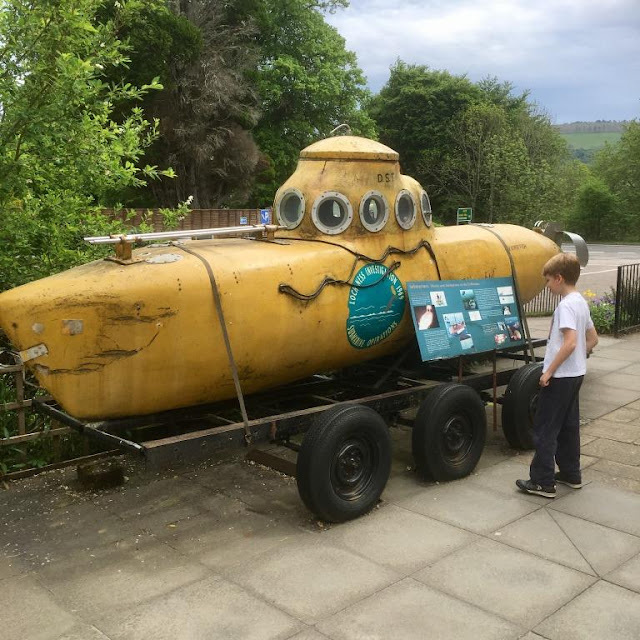 The Loch Ness Centre and Exhibition is in Drumnadrochit. This is an interactive attraction taking you through the story of the Loch Ness monster. It explained about the plausible reasons for people thinking they had seen something and also some of the scams and fake sightings. At the centre, there are seven themed areas exploring Loch Ness from its beginning to present day, and in each section, a video plays explaining a different part of the Nessie mystery, which you stop to watch before moving on as a group. At the end, there are lots of memorabilia including newspaper articles reporting sightings. The village of Dores is at the top end of Loch Ness. 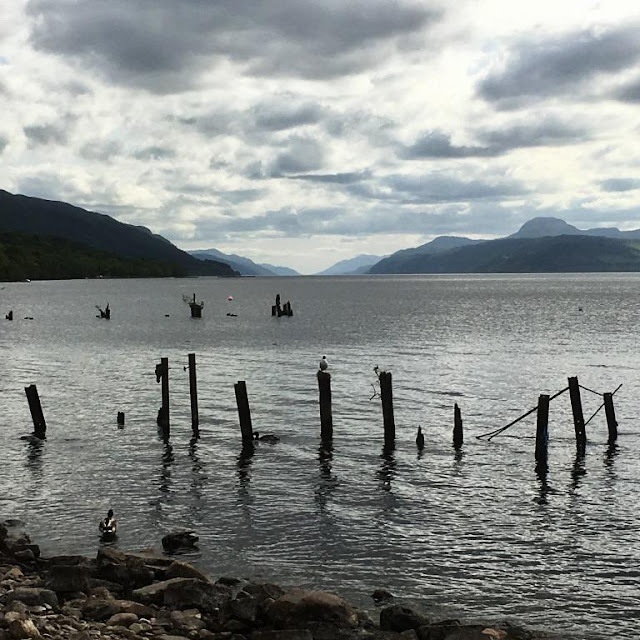 Dores beach is a pebble beach that stretches across Loch Ness from the village of Dores and the Dores Inn to Torr Point and has some of the most iconic views of Loch Ness. Here you will find not only a beach but also the legendary Nessie Hunter. Dores Inn is the only pub & restaurant spectacularly situated on the shores of South Loch Ness. 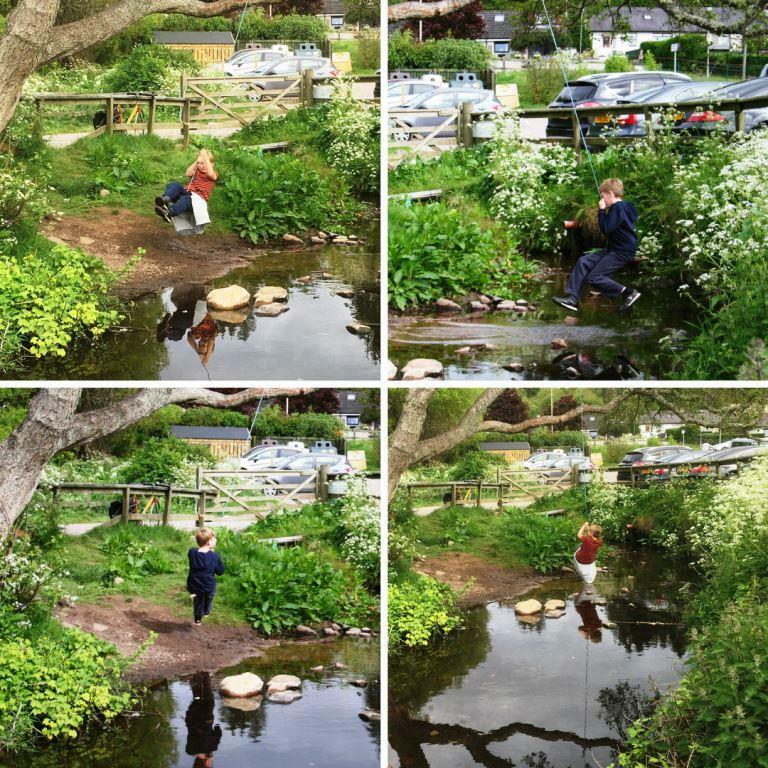 As well as the beach you can also enjoy home made food, ice cream and there is rope swing over the stream which is so much fun. There are waterfalls on both the north and south side of Loch Ness. Follow the South Loch Ness Trail to Foyers for the short walk down to the beautiful Falls of Foyers. It's only a 200m walk to the higher viewing platform and 300m to the lower platform. From where you get stunning views. On the north side at Invermoriston another short circular walk through the trees takes you to Invermoriston Falls. The walk itself starts behind the village hall, it's circular and takes you through the woods, down past the falls on to the summer house from where there are just breath taking views and then returns past some of the best tree shapes, some perfect for climbing and there were still bluebells in bloom that made this walk even more beautiful. 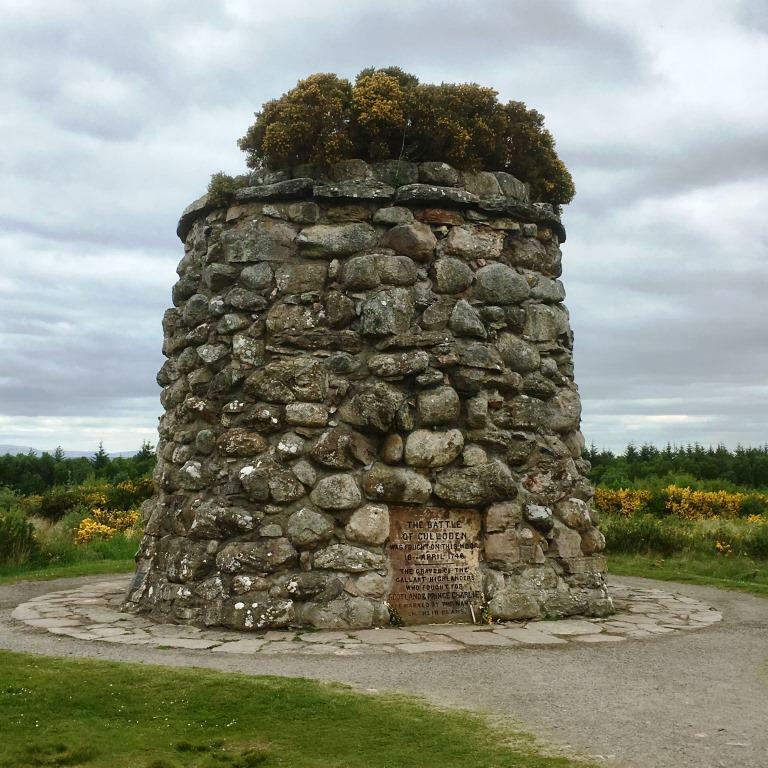 Culloden Battlefield Visitor Centre is close to Inverness. This is a National Trust Scotland property and a powerfully moving site where the 1745 Jacobite Rising came to its tragic end. 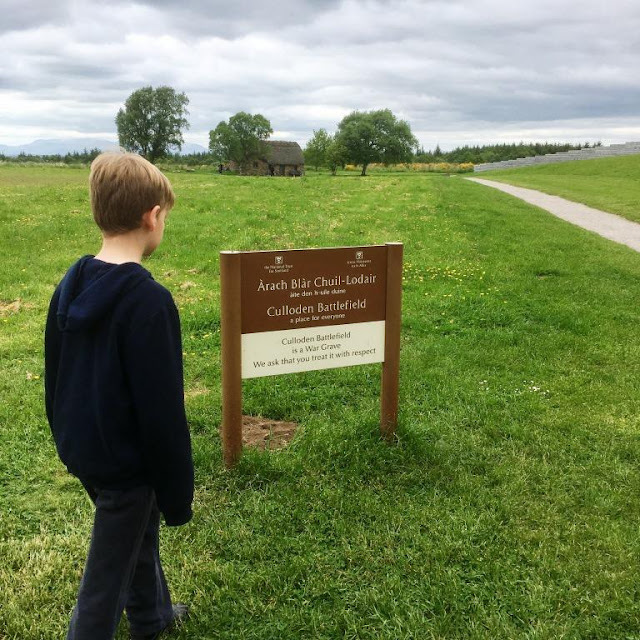 This centre opened ten years ago and tells the whole Battle of Culloden story in an innovative and interactive way which appeals to all the family. In the Battlezone, you can experience first-hand what it was like to be in the middle of the action at the Battle of Culloden. 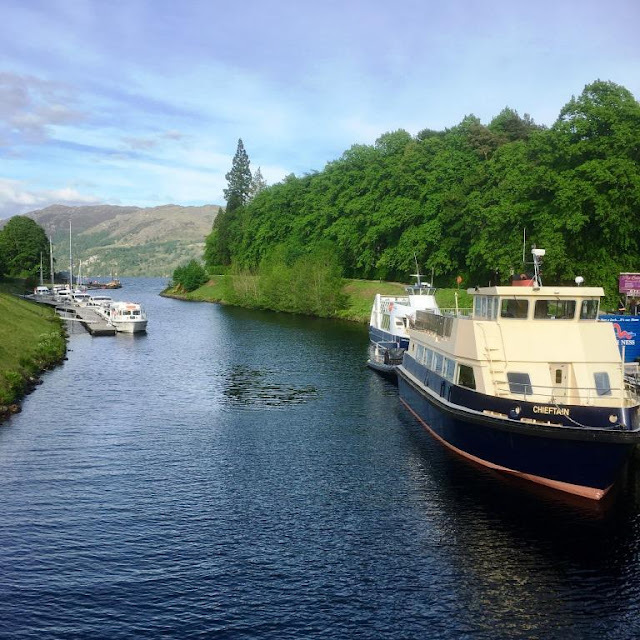 Lying on the impressive 60 miles long Caledonian Canal, halfway between Inverness and Fort William, is Fort Augustus. Although the town only boasts a modest population of around 400 people it is a popular and busy tourist destination. It offers spectacular views down Loch Ness and you can also sit and watch the boats navigating the locks whilst eating fish and chips. Less than an hour south west, on the A82, is Fort William. 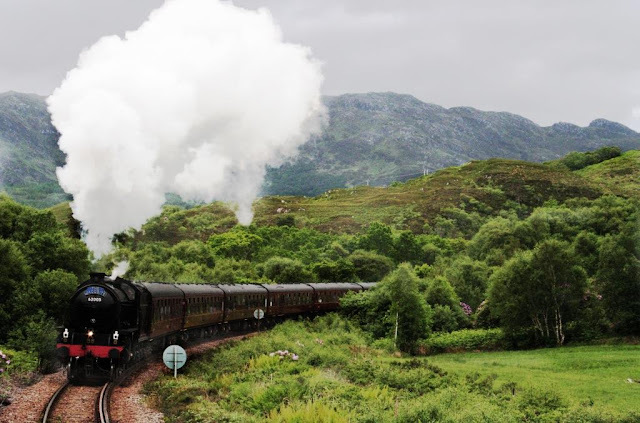 From here you can either travel on The Jacobite Express train or as we did follow the Hogwarts Train through the Highlands on its journey north to Mallaig. 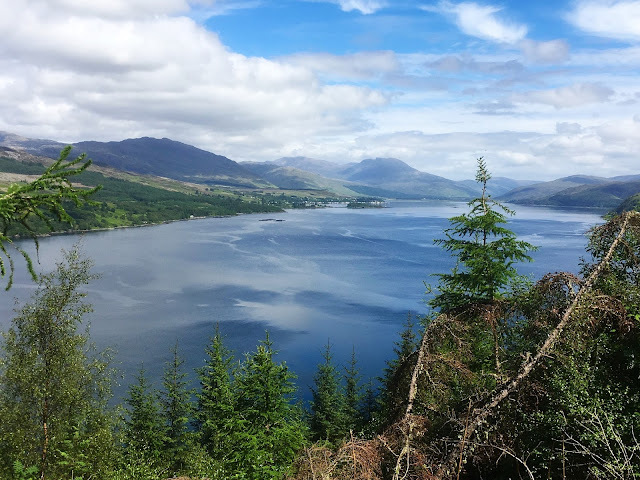 From Fort William head to Glenfinnan where there is the National Monument and the Viaduct. The Jacobite crosses the 21-arched Glenfinnan Viaduct, made famous in the Harry Potter films, which overlooks Loch Shiel and the Jacobite monument. The viaduct is 380 metres long and 31 metres high, and the train crosses twice a day between April and October, with the best viewing times of between 10.45am - 11 am and then again from 3.05pm - 3.20pm. If you time it right in Mallaig you can wander along the station platform and see the train. Don’t miss the fantastic white sands too on the coastal route back. The 13th-century castle is one of the most iconic images of Scotland. It’s THE castle on a lake. It is recognised around the world and has appeared in many films including Highlander. It is located on an island where three sea lochs (Duich, Long & Alsh) meet and is surrounded by amazing scenery and picturesque villages. Although less than an hour away it’s actually on the other side of Scotland, you are very nearly on the Isle of Skye when you arrive there – and can see it in the distance. Just 20 minute further on and you can spend some time in the beautiful Plockton also known as the ‘Jewel of the Highlands’ and make sure you take a picnic as the view over Loch Carron from the picnic spot is very hard to beat. 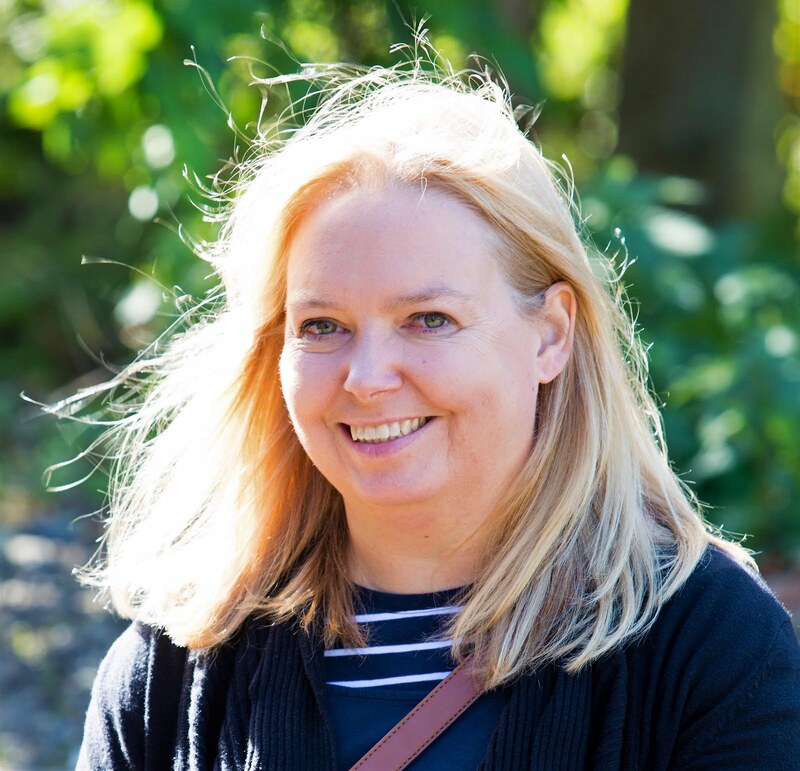 From Inverness marina take a trip on the Dolphin Spirit Wildlife Cruise which offers a comfortable, family friendly, easy access, trip around the Inner Moray Firth. On the trip, you are accompanied by a specialist guide giving full commentary. The dolphins in the Moray Firth are common bottlenose dolphins (Tursiops truncatus). They live in groups of between 10 and 30 individuals called pods. A 20-minute drive further on and you can be at Chanonry Point. Apparently, the place where it is easiest to spot dolphins in the UK - and in the 10 minutes, that we were there enjoying an ice cream we spotted a couple of dolphins too and a crab. Dolphins at Chanonry Point can be seen at any time (and not at all!) but the best time to see them is usually on a rising tide. From around 1 hour after low tide, the tide turns and dolphins start to chase fish in. Drive through the golf course and at the end is a small car park. 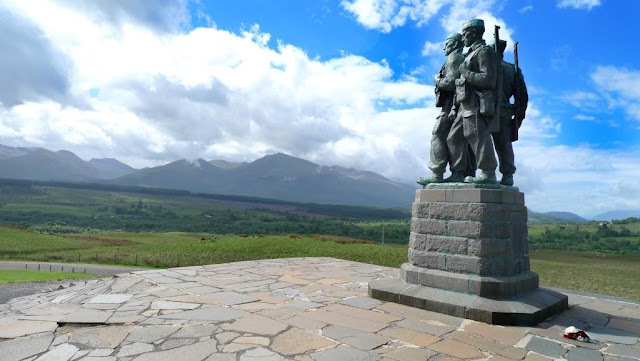 Make your way along the Great Glen Way through Fort Augustus, past Loch Oich and Loch Lochy and stop at the amazing viewpoint by the Commander Memorial just before Spean Bridge, from where you have uninterrupted views of Ben Nevis and the Nevis Range. 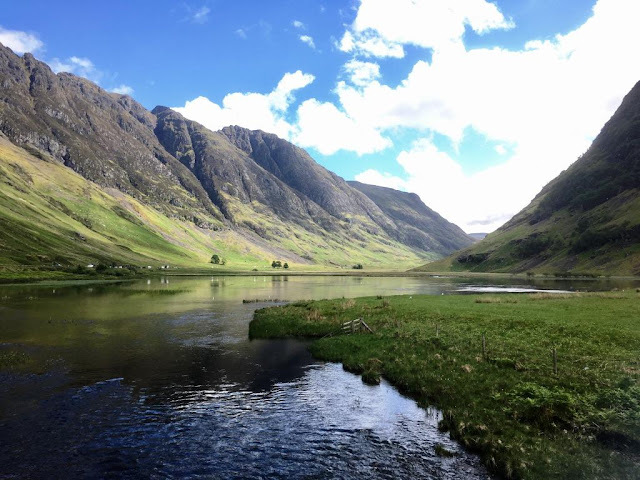 Another 20-30 minute drive and you’ll arrive at Glen Coe. This is a place that is stunning. No description can re-create the impact of seeing Glen Coe for the first time. Beautiful, amazing, awe-inspiring are all words that don’t even do it justice! Thousands of visitors head here every year and many have seen it on film before they arrive too. Filming for some of the third Harry Potter film took place on location in Glen Coe too. Have you been to Loch Ness? What did you do there? 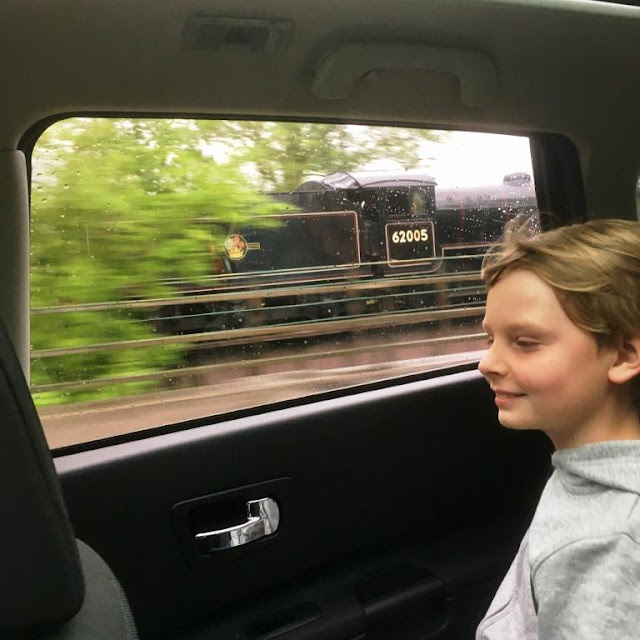 PS We are linking up with MONDAY ESCAPES - check it out for lots of great ideas for travelling with kids. I'm so intrigued about seeing dolphins! I had no idea you could see them this close to home! This is amazing. We keep saying about visiting Scotland, it looks so idyllic. You make me really want to visit, it all looks so amazing. Shame it's at the other end of the country for us. Wonderful pictures in your post and great ideas. I've never visited the highlands but always wanted to. Wow what beautiful views! This is somewhere I'd love to visit! Looks beautiful too! Oh Wow! This is brillant! My boy is cray about dinosaur and really want to go to visit Loch Ness one day. The Rope Swing at Dores is really a heart stopping point isn't it. Eilean Donan Castle is so beautiful. I think my kids would enjoy that too. I still need to take my kids to a castle this summer yet. I must! I must! Nope, I've never been to Loch Ness and if fact have rarely even been to Scotland! I did however climb Ben Nevis once but I do keep thinking that I really need to explore Scotland more.